Mint gutter pair. A gutter pair is torn from the centre of a stamp sheet and consists of two stamps with two blank fields between them. A sheet of stamps usually holds 3-5 gutter pairs. Åland Post is one of a few postal administrations in the world that offers gutter pairs. Cancelled gutter pair. A gutter pair is torn from the centre of a stamp sheet and consists of two stamps with two blank fields between them. A sheet of stamps usually holds 3-5 gutter pairs. Åland Post is one of a few postal administrations in the world that offers gutter pairs. A gutter pair strip is a complete strip of all the gutter pairs from a sheet, normally holding 3-5 gutter pairs, totalling 6-10 stamps. 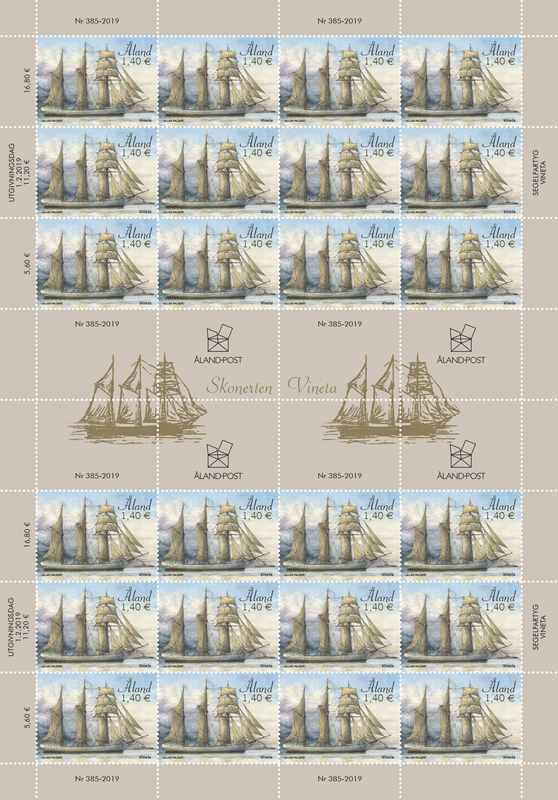 A full sheet is a complete sheet of stamps, usually between 24 and 40 stamps. All stamps that are not issued in the form of miniature sheets, booklets and self-adhesives may be ordered as full sheets. 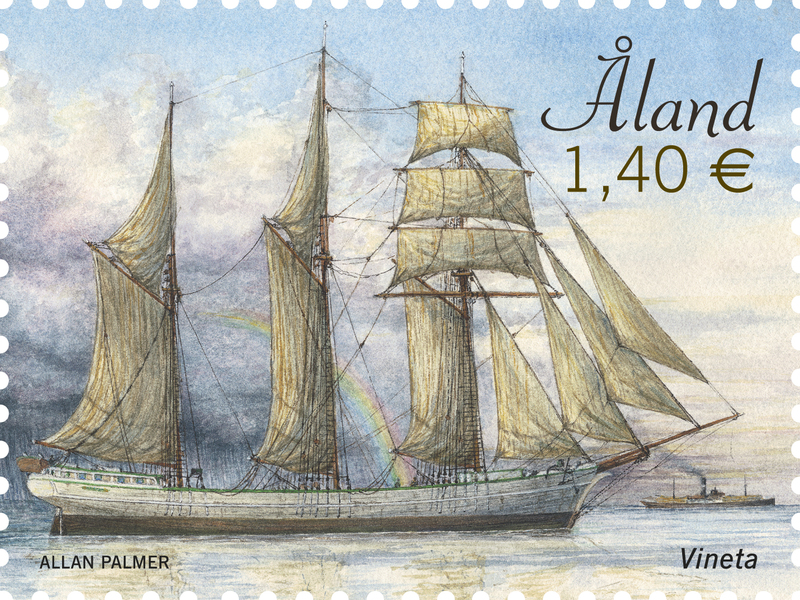 Description: The stamp featuring the schooner Vineta is part of a 6-year sailing ship series that also includes stamps featuring the schooner Leo and the barquentine Lemland (2015), the brig Altai and the barque Pehr Brahe (2016), full-rigged clipper Mermerus and the barque Mariehamn (2017), full-rigged clipper Albania and the schooner Atlas (2018) and 4-masted barque Parma (2019). The series will be completed in 2020.